or mildew. The clear net wont spook fish because it virtually disappears underwater. The frame is made from laminated bamboo and hardwood. 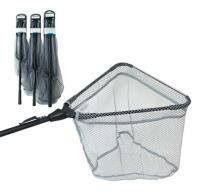 Anglers looking for a great deal on a reliable fishing net just love the Cortland Flip Up Net range. Cortland Flip Up Nets are a breeze to use in any situation when an angler needs a fishing net fast. Cortland Flip Up Nets have been designed for anglers who fish on the move. The nets offer a strong and lightweight solution to landing fish of all sizes. With their folding action arms, Cortland Flip Up Nets nets can be folded away and carried or transported with ease around the lake or river until the next fishing spot. With a fully adjustable handle, fish friendly mesh and safety lanyard these nets offer fantastic value for money to anglers who fish both moving and still waters for a wide variety of species. The fish friendly mesh is perfect for those who choose catch and release fishing. The new Cortland Flip Up Game Net has been designed for anglers who fish on the move. The 40, 50, 60cm nets offer a strong and lightweight solution to landing fish of all sizes.